If you've been following our blog for a while you know that one of Dave's favorite events is Epcot's International Food & Wine Festival. The World Showcase turns into one big party with great food and beverages. 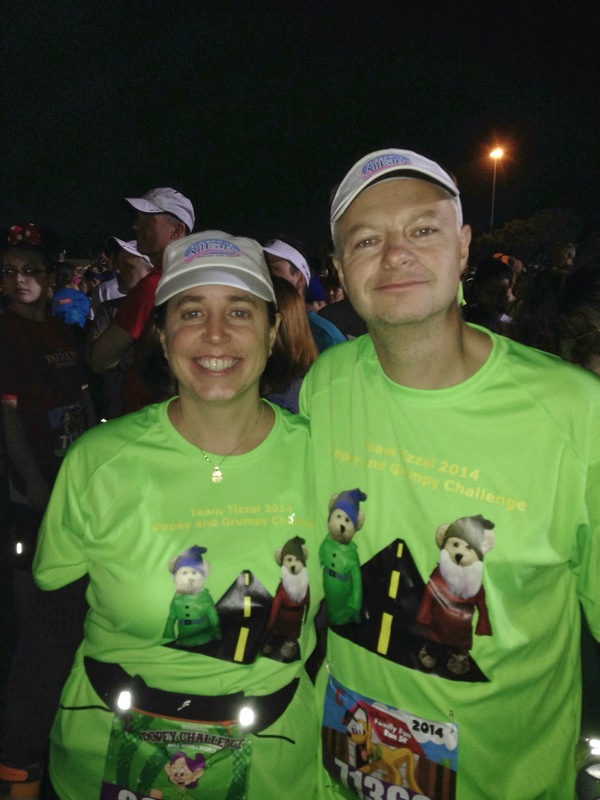 This year Holly had a race (The Tower of Terror 10 Miler) scheduled at Disney during the festival's opening weekend. Dave unfortunately had to stay home due to work obligations. So he wouldn't feel left out Tizzel (with some help from Holly) put together Tizzel's Food and Wine Festival. Dave arrived home on Thursday night to find an invitation to the festival and a food listing. This was going to be exciting! Along with all the food, a seminar on soufflés by one of Tizzel's friends, Beepie the bunny, was on the schedule. She's an alleged world famous pastry chef. Everything was scheduled to take place on Saturday. Upon arrival I was greeted by some cute bears in food-related costumes. 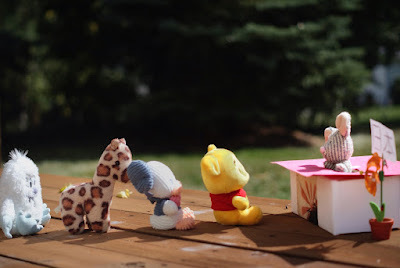 They were sent by one of the sponsors; Boyds Bears by Enesco. Their job was to entertain the attendees and hand out coupons for their online store. This was a cute addition to the festival and I hope they return if there's another one. Since it was almost noon I headed to Beepie's souffle seminar which was held indoors at the Festival Test Kitchen. What a waste of time! I paid the discounted price of $8 for this seminar and didn't even get any food. This "pastry chef" didn't do a live demo or anything. She just stood there an lectured to us about not letting our souffles fall. No kidding! She also had this strange accent that made her hard to understand. Almost like she hummed everything. Finally time for a food booth. 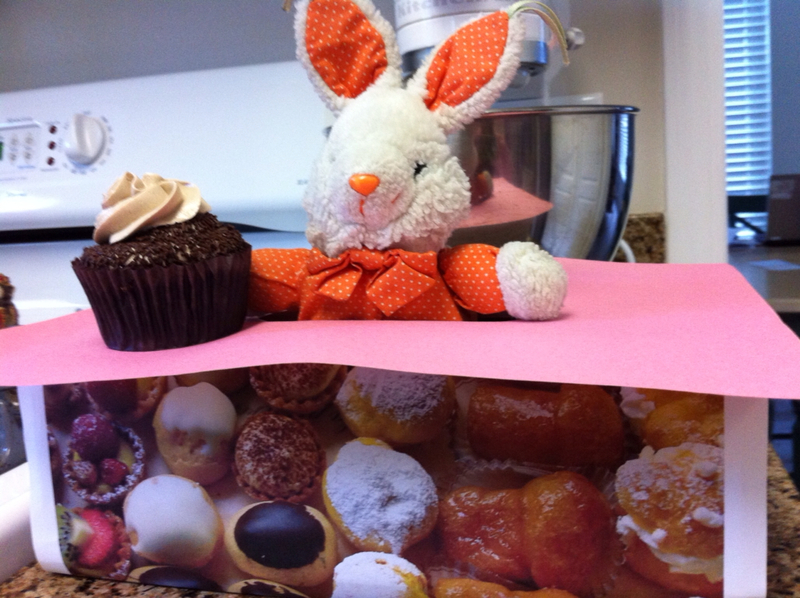 There were three, plus the nighttime dessert offering in the Festival Test Kitchen. Two of them we're in my backyard thankfully. 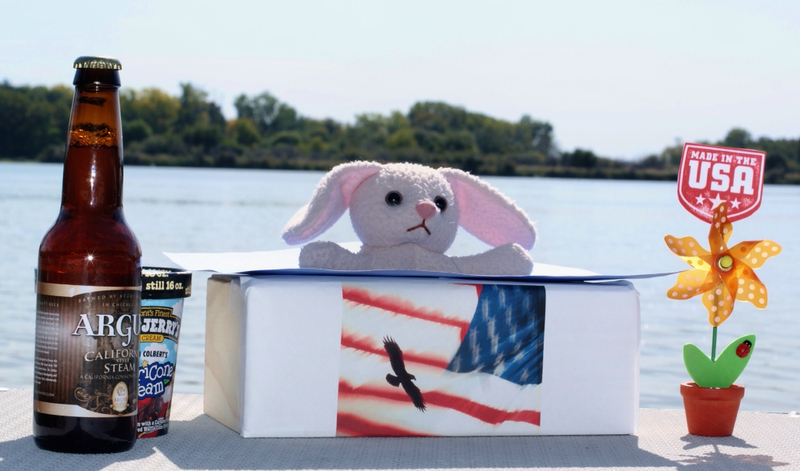 The other one was by the lake so I had to arrange transportation to it. Geez! 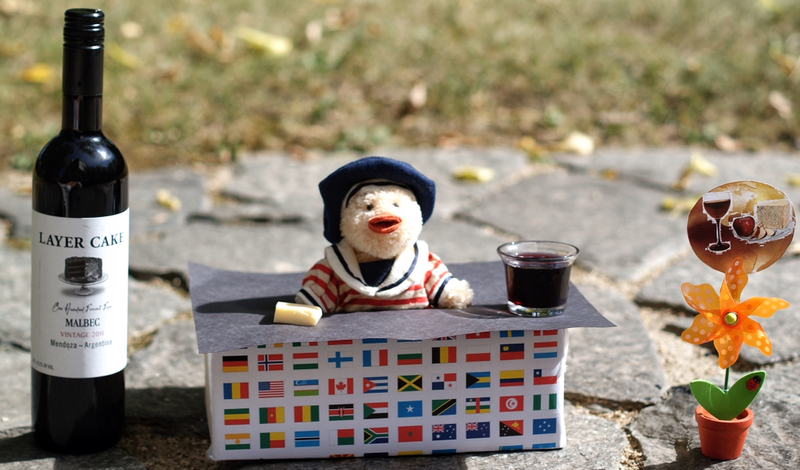 I started at the International Wine and Cheese Booth. I could buy a malbec, a cheese and cracker platter, or combine both for a special price. I was actually surprised that I had to pay anything since I am sure Tizzel conned Holly into some money at the Jewel's. I went for it and paid $9.75 for the combo plate. I got a 2oz wine (in a real glass), a flat bread with three ok size pieces of Black Diamond cheddar, a couple blackberries, and a few squares of chocolate - all served on a real plate with a plastic fork. Go figure..... The cheese was nice - more mild than anticipated. The wine was very good too. I could have used some more but it was $5 for a refill. Too much for my blood. I could tell by the food listing that the festival was set up to serve appetizers at one booth, main course at another, and then dessert at the final booth. Armed with that knowledge I headed to the Japan booth. Food here must be good since there was a line. The menu listed assorted sushi and sake. Fancy! While on line I talked to a cast member and they told me the mouse working the booth was originally at the international booth. That didn't work out so well so they moved him to work the Japanese booth. Finally my turn. I order a California Roll plate and sake with the souvenir glass. Pretty good for the $11 price tag. This was a very popular booth, thus making the area crowded. 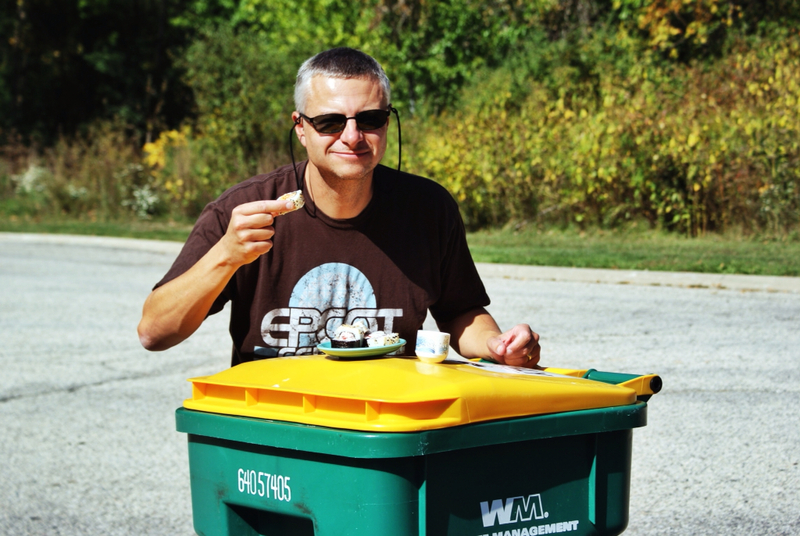 Since all the deck chairs were taken and I had to enjoy my nice meal on a trash can. Come on guys...... The logo is crooked and I can see the tape. 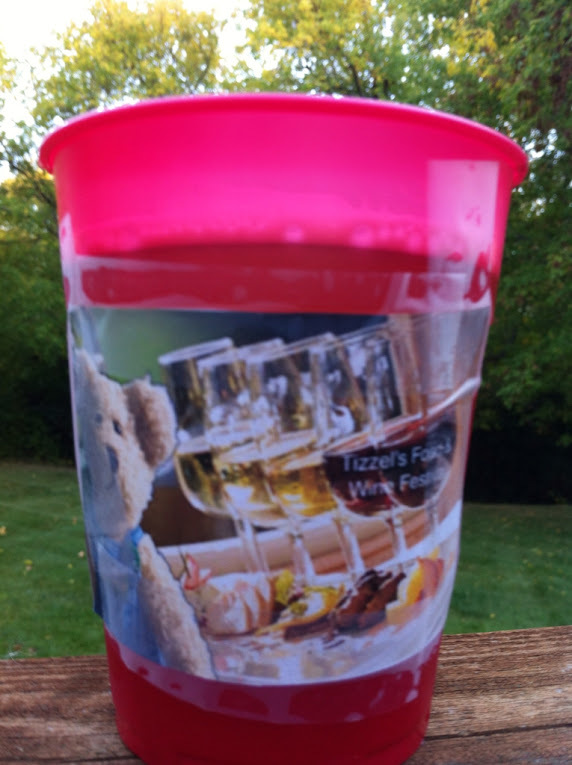 I bet this is less dishwasher safe than a Disney pint glass. I ordered the ice cream which was a decent sample at $1. Ben and Jerry's Americone Dream is one of my favorites. Nice vanilla ice cream, gooey caramel, and crunchy/melty chocolate waffle come pieces. The final stop of the evening was to go back to the Festival Test Kitchen for a cupcake. Beepie claimed to make this herself, and charged me $5. I found a Sweet Discoveries box in the trash so I knew better. Even with that knowledge I picked the Chocolate Delight. 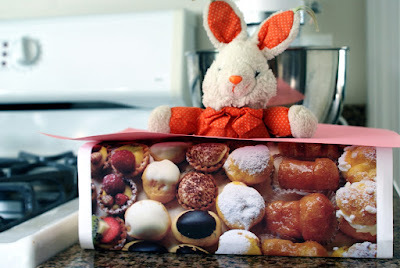 Very good - even though I paid Beepie double what it costs at the actual store she got it from. I sampled everything. All offerings were very good, even though a bit pricey. 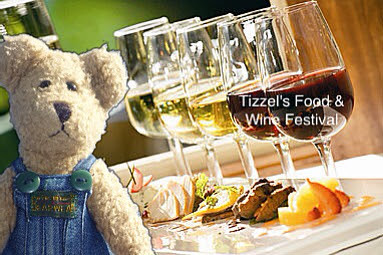 Later in the evening Tizzel came up to me as I went to the office to write this review. He said he was donating all the proceeds to our breast cancer charities since it was so close to October, breast cancer awareness month. He asked me how he could donate to Avon Breast Cancer Charities through Team Allears and I gave him this button link to our donation form and reminded him to put "Team Tizzel" in the comments. On a serious note: Holly did something special for me to feel like I was part of the fun in WDW this weekend and I appreciate it so much. She's down at Disney with some special people that are taking the fight against cancer seriously and personally. Our friends at Team AllEars are doing an incredible job raising money, promoting awareness, and supporting folks with cancer. If this post put a smile on your face, please consider making a small donation to our cause. I lost my mom to breast cancer and watched two friends fight the disease this year. Your donation will make a difference. Thank you. With The Sunriver Marathon behind us it was time to do some of the other events on our list. 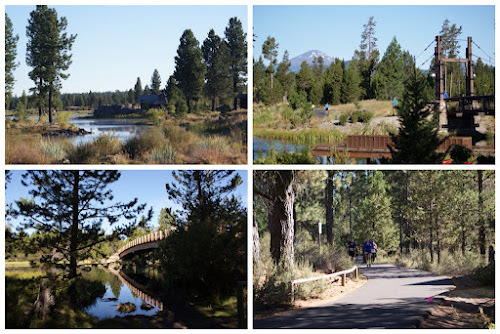 Monday morning (Labor Day) we left our resort and headed to Bend. 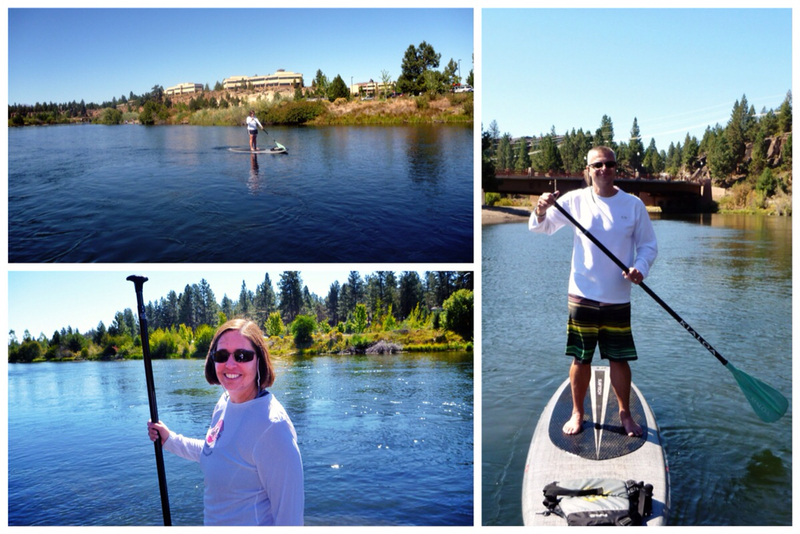 Today's plan was to go out for breakfast, rent paddle boards in the park, visit the remaining breweries on the passport, collect our prize from Visit Bend, and then (depending on the time) go back to the hotel and canoe, bike, visit the pool. Breakfast this morning was at Chow. Dave lucked into finding this place while using Urbanspoon. Chow was in a residential area in an old house. It follows the sustainable/farm-to-table philosophies. There was a nice deck and patio area out front, with lawn chairs set up for guests waiting for tables. An outdoor bar was set up for morning favorites. 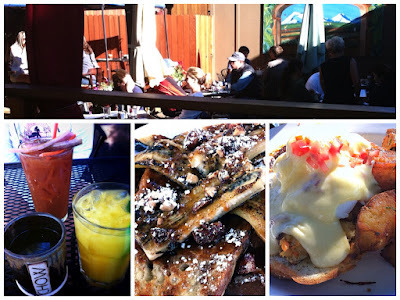 We took a patio table and froze for the first twenty minutes until the sun hit our table. We ordered breakfast cocktails and some great entrees. Holly had the crab cake eggs benedict and Dave had the banana pecan french toast. Great food! The staff was friendly and the owner/chef checked in on us. We were also lucky enough to be there when the singer started. This is 9:30 in the morning. Nice touch and helped to set the mood for a relaxing breakfast/brunch. Thanks to him we established we were once again the odd visitors from Illinois. We made it to Riverbend Park exactly at 10am, which was when the Sun Country Paddle Board rental sight was supposed to open. Apparently Labor Daywas the start of their fall hours with the new opening time at eleven. The kid showed up at 10:20 and we tried to con him out of an early rental. No luck. So we sat on a rock until 11am. The rental cost us $20 each for an hour. 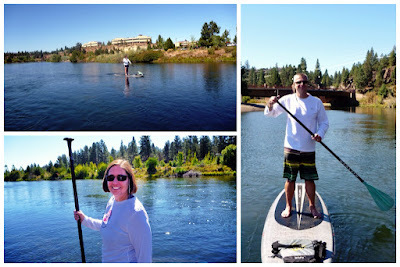 The Deschutes River was clear with lots of views to the bottom. We passed under a bridge and by rocky canyon walls. Lots of other people were out enjoying the park by kayaking, tube floating, paddle boarding, biking, and playing fetch with their dogs in the water. It was nice to actually paddle somewhere you didn't have to worry about clueless boaters and constant wake from skiers. After all that work it was time for a beer. 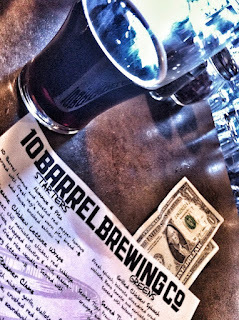 We drove over to 10 Barrel and the place was packed! Lots of folks taking advantage of their large patio on a nice day. Unfortunately we we still stuffed from breakfast so couldn't think about trying anything for lunch - too bad since it all sounded good. We were in luck here with a couple dark beer choices. Sinister Black and the seasonal porter were right up our alleys and bargains at $4 each. Good news was our hotel had Sinistor on tap! 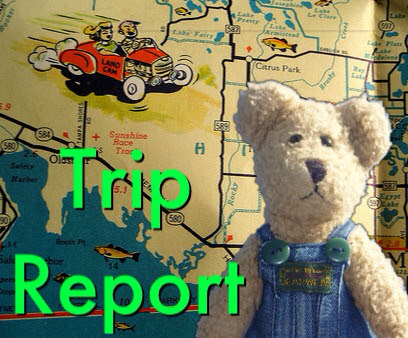 We got our passport stamped and took off for the next stop. The last passport location to hit was Silver Moon. They were in a re purposed building in the older industrial section of town. It had a little bit of that retro diner edge. We lucked into the fact that it was locals day so pints were $2.50 (Dave got the lowest IBU beer possible) and the 22oz bottle porter Holly had was $3.85. Combine those with a pork quesadilla and we were out of there with a $12 bill. Everything was really good and I'd consider a return visit there. With our last stamp collected we headed to the Visit Bend office. Other than race items, we hadn't purchased any souvenirs yet. We spent $72 in the Visit Bend store. 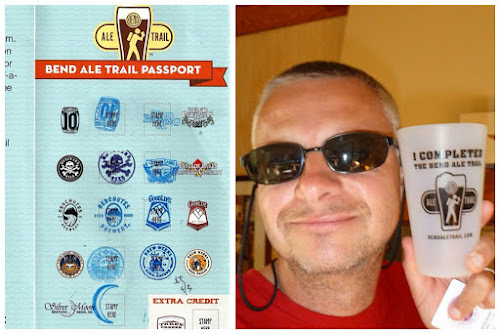 We collected our free Silipints for finishing the Ale Trail then bought a long-sleeve t-shirt, poster, regular pint glass, hydro flask, and sticker. Everything we bought was nice and represented our trip so far. We already accomplished a lot today so why not go canoeing? We headed back to the resort and drove out to their marina. 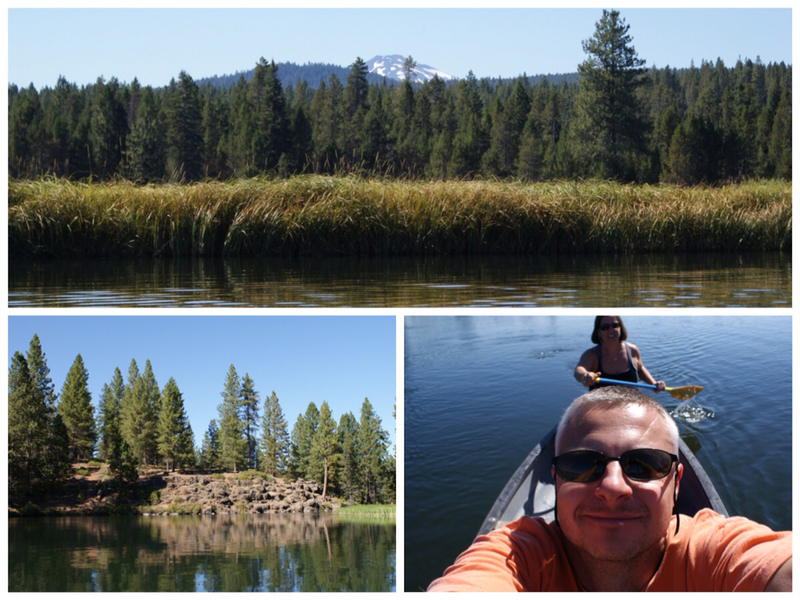 We rented a canoe for $65 so we could take a six mile trip down the Deschutes. We haven't canoed together in 18 years because the last outing resulting in an argument. Needless to say we were nervous of a repeat. Happy to report there were no fights. Just a nice trip where paddling was only necessary to keep you away from other boats and the shore. Dave sat in front to take pictures and video while Holly steered us along. We had a really nice time and this was the highlight of the trip. The scenery was gorgeous and totally different than what we get to see on a daily basis back home. Nothing else happened after this. We skipped the pool and biking. We ended up at the hot tub by our room with a couple of beers, followed by a visit to the resort's bar, The Owl's Nest, dinner at the main restaurant, then back to the nest. A very fun day! 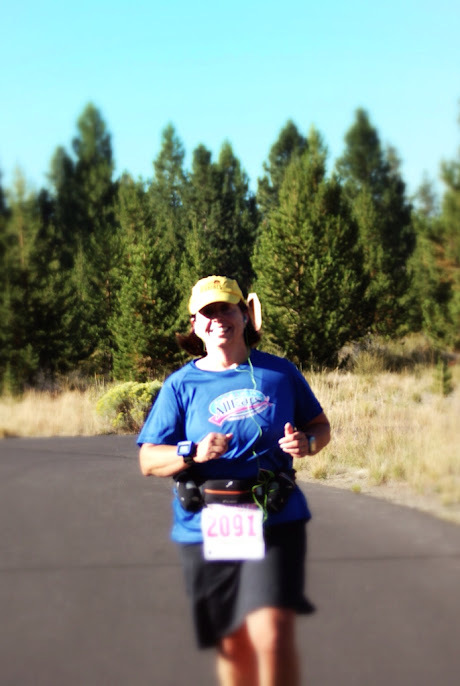 Here's Holly's Sunriver Marathon Race Report and video. 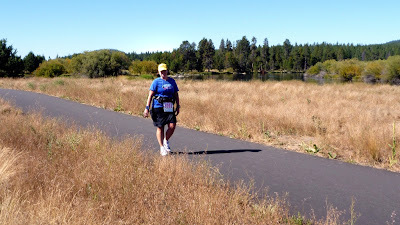 After the major carb loading I did in Bend on Friday, the Sunriver Marathon on Sunday should have been a piece of cake right? Not so much. I was really nervous for this race. My legs were dead all summer. I tried some new things in my training to try and break the 5 hour barrier. Confession time, I pretty much have always ran my midweek shorter runs at the same pace (if not slower) as my long runs on the weekend. I should have had faster midweeks and slower long weekend runs. I decided to do Hal Higdon's Intermediate program with 5 days of running and one day of biking. I started late in the program but didn’t think it would be a problem since I ran 4 marathons in the spring and should have a good base. Wrong again, actually my legs were tired and I should have just taken it easier this summer and probably done the Novice training. I did my mid weeks faster than ever before and on an incline on the treadmill. When it came time for my back to back weekend runs, my legs were dead. My long runs were the slowest and hardest I have ever run. I started hating running. I also started having trouble with my hamstrings being very tight. I was irritable, not sleeping well, ask Dave I was pretty miserable. I was totally over training. This was supposed to be fun right? I kept saying get to the taper and you will be fine. I made it to the taper and I was not fine. Legs still dead. I stopped running back to backs for the two weeks before the marathon. I got massages to try and help loosen things up. I was hoping for the best. Did I mention that Sunriver's elevation is +4,000 feet? Combine that with a bad training cycle and I'm sitting in the hotel room at 6:30am TOTALLY FREAKING OUT. 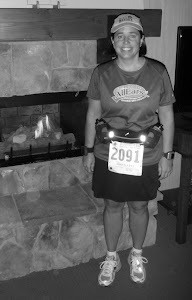 I finally left the room fifteen minutes later and walked the 5 minutes to the starting line. There were only about 100 in the marathon and we were starting a half hour earlier than the 350 half marathoners. The weather was perfect. A chilly 40 degrees getting up to high 60s or low 70s . At least I had one thing that I did not have to worry about. The National Anthem was sung, I cried as usual and said a quick prayer to God to please keep me safe and I was off to attempt to finish Marathon number 15 and State 12. The course was spectacular. We ran through the entire Sunriver Community. 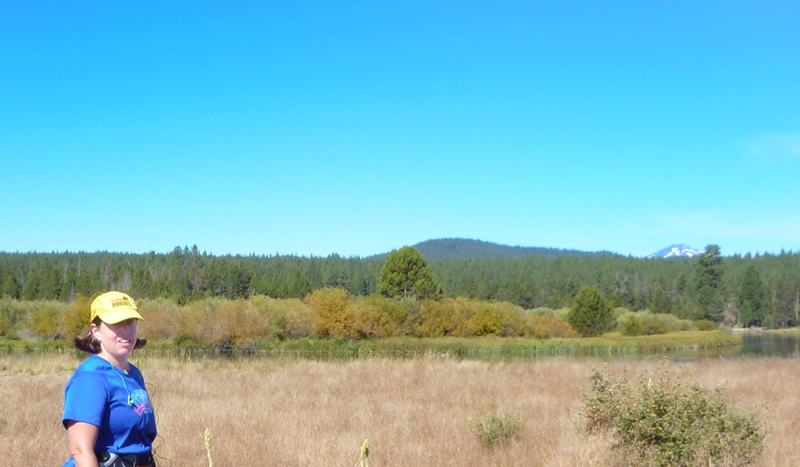 Which was filled with bike trails, golf courses, and lots of evergreens. Every turn brought another picturesque scene. I started ok and things felt pretty good. I had a nice initial pace and was still at the back of the pack, but I figured that would happen and prepared to run this by myself. I think the mind games/fatigue started around mile 8. 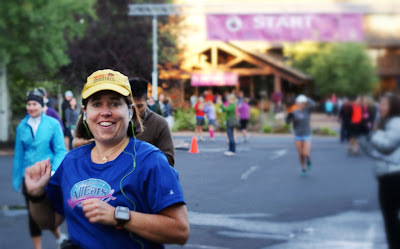 I was thinking that I was way too tired to be only at mile 8. This just kept continuing. I would get distracted and think I am fine, totally fine, and then I would say no, I feel sick, my legs are so heavy. Back and forth with myself the entire day. I managed to pass a few people so I was making some progress. The half marathoners caught up to us around mile 8 and that was a nice distraction. I saw Dave so many times and it was awesome. He kept asking how I was doing and it kept getting worse each time. First it was “I don’t know”, then “too tired for this early” then “ my hamstring is locked up, going to have to walk more” until finally “what’s 16 X 6” I was too tired to do math in my head to make sure I was going to make the six and half hour cutoff time. Around mile 22 one of the Marathon Maniacs I passed around Mile 8 caught up to me. I was still shuffling along at that point and he was power walking. We both decided to walk it in together and we both figured we would make it in 6 hours, which I really hoped I would. Let me tell you a little about this Maniac. 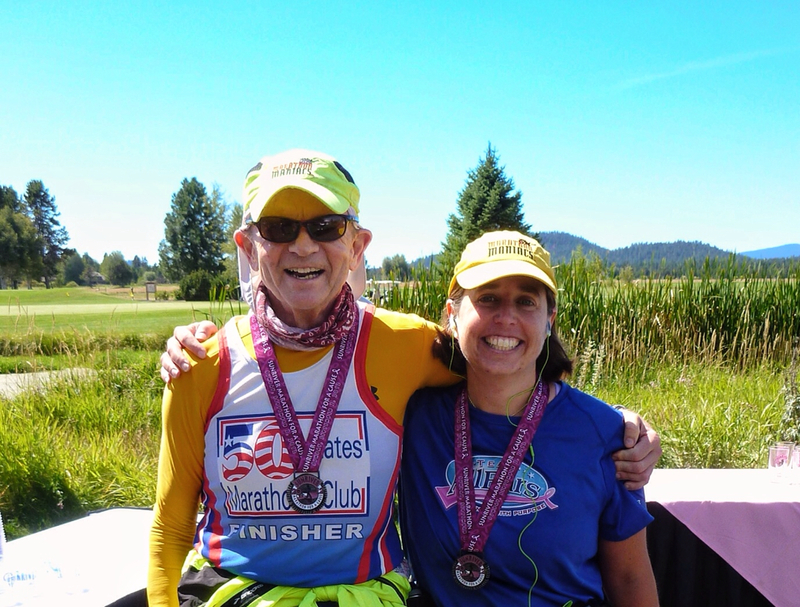 His name is Larry Macon and he is the Guinness World Record holder for most marathons in a year. 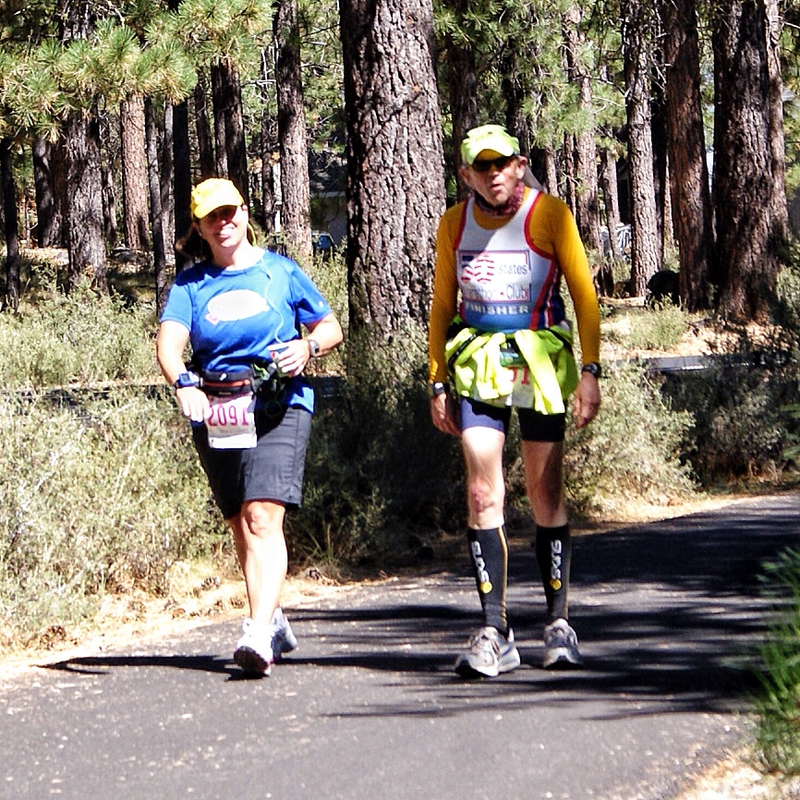 In 2011 he ran 113 marathons. Yes 113 marathons. The day before Sunriver he ran the Pocatello Idaho marathon. He then flew into Portland and drove to Bend getting in at 3:30 in the morning. Got a couple hours sleep and started Sunriver. 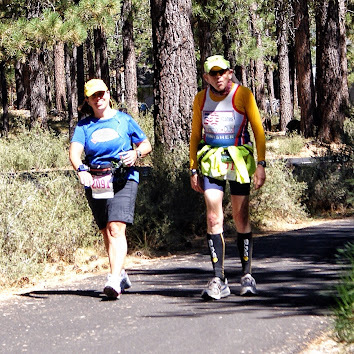 After Sunriver he was flying to Colorado Springs to do their marathon the next day. Did I mention he is 67? He is one interesting guy and I thoroughly enjoyed walking those last 4 miles with Larry. He has completed all 50 states, 14 times! We both got to know each other very well and I am looking forward to running with him again. We both ran it in and finished in 5:54. At the finish line we received our medals, a pint glass, and a long-sleeved finisher shirt. 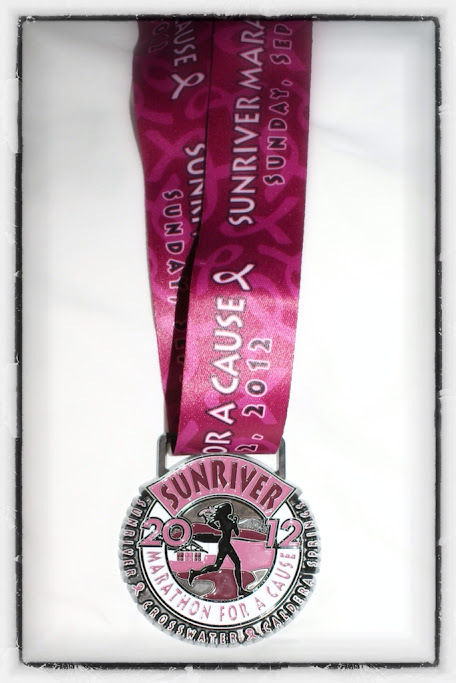 Really nice swag, especially for a charity race (breast cancerbeneficiary). Lots of snacks like bananas, orange juice, popsicles, Sun Chips, etc. The race was era well organized and the volunteers were very friendly. 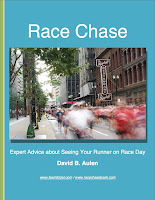 I'd recommend this race to anyone. It was definately not my best, but it was not my worst. I learned a lot about myself, and what my body can take. I am now running for fun again. This week I got my first runners high in months. If I ever break 5 hours it will be great, but if I don’t I am sure going to have fun trying. 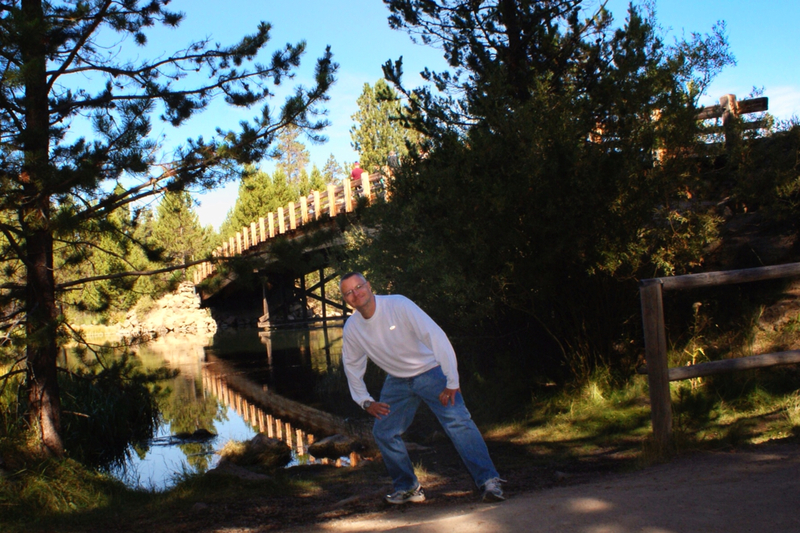 Staying at the Sunriver Resort was a big plus. No long walk to the start or wait for the race to begin. Mile 1.5-5.5 went through a gated community so this gave me an hour go get something to eat at the hotel's cafe and casually drive to my first spectating point. The biggest plus to this race was the fact that roads were not closed. 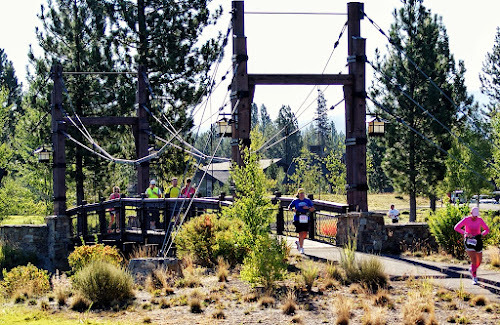 Runners used the resorts vast network of bike paths. This made getting around so easy. Sunriver's community map made it easy to follow the course. 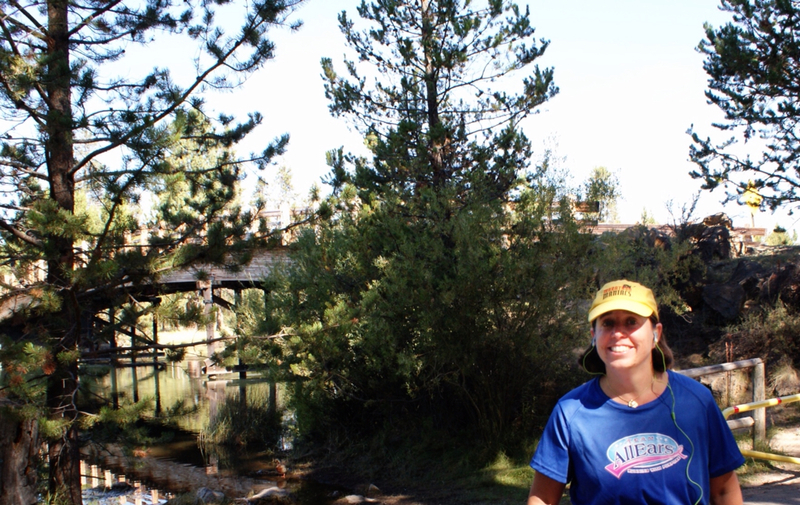 I ended up seeing Holly at the start, miles 5.5, 8.5, 10, 12, 13, 15.5, 17, 19, 20, 22, 24, and the the finish. Open roads and a small race helped to accomplish all this. Other snacks included free coffee at mile 10, a pack of Sweettarts I bought the night before, and beer and pretzels from the golf course. Around August 17th country music singer Joe Bachman filmed a video for the song "Small Town Rock Stars" at Blarney Island. Some good shots of the island and of the usual tie-up parties at the Petite Lake Sandbar. Tomorrow is one of the last weekends the island is open for the season and the temperatures should be in the 40's-50's. Yeck! We were dropped off at our hotel by the Bend Brew Bus around 5:45. 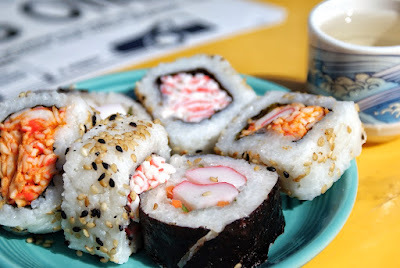 We stopped back into the room for a quick Voodoo Doughnut break and then headed one block towards the center of town. Bend's main downtown area is about 3x4 small city blocks. There were a few national stores and chains in the area (Starbucks, Patagonia) and lots of smaller boutiques and specialty shops. There was a good selection of dining options featuring ethnic foods, pub grub, and a few steakhouses. 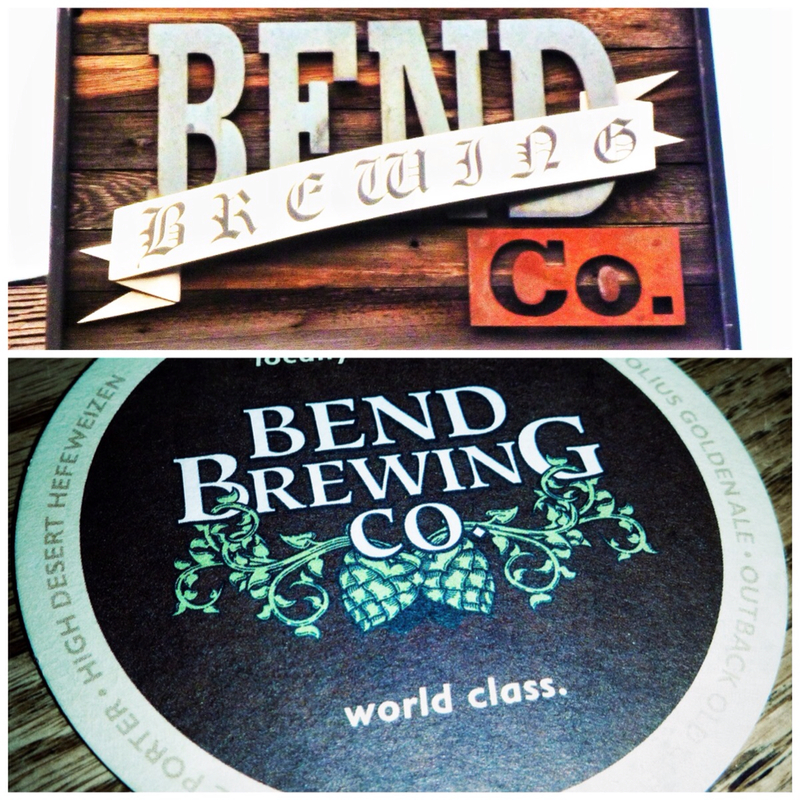 For the beer hunters the center of Bend is a good location to do some serious brewery touring. 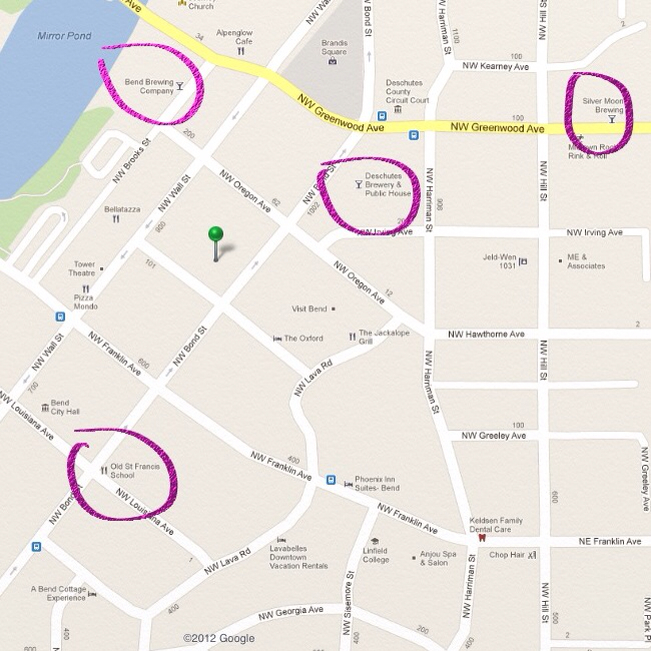 There are 4 breweries within 5 minutes walking distance of the center of town. Luckily today's Brew Bus didn't visit any of them so we were at a good point to continue as self-guided tour. 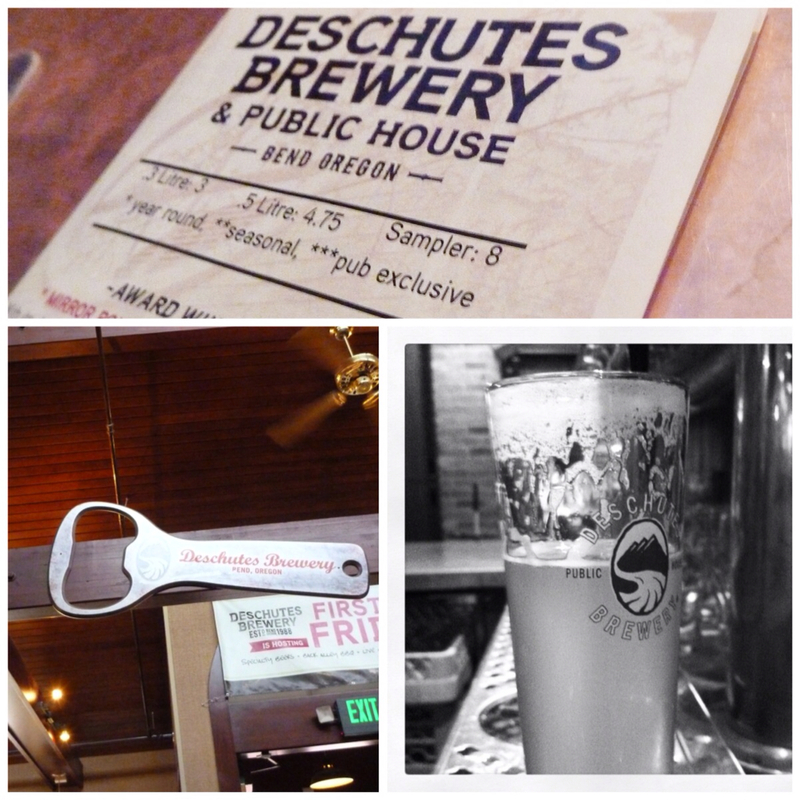 Deschutes Brewery was our first stop. 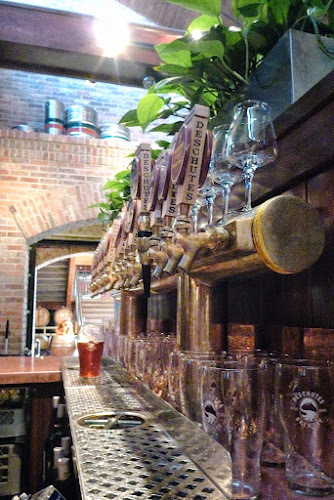 This downtown location is mostly a restaurant and bar since the bulk of their brewing happens at their location by The Old Mill District. The place was lively as you'd expect around 6pm on Friday. We ended up at two low bar seats (for wheelchair patrons) right next to the taps. This gave us a chance to talk to the bartender a bit. Apparently they don't get many folks visiting from Illinois. 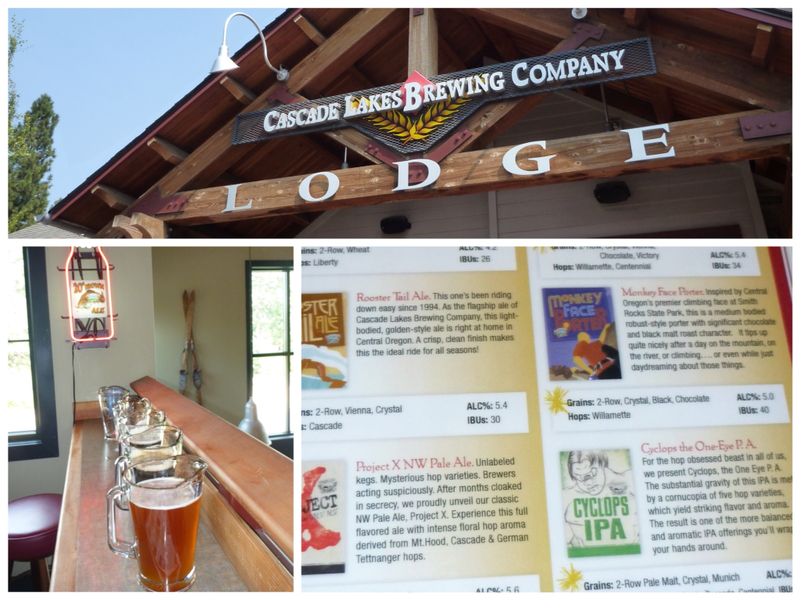 The beer list was big, but mostly full of hoppy, higher IBU beers. They were out of stout so Holly ordered a Big Butte Porter and Dave had the organic blonde. 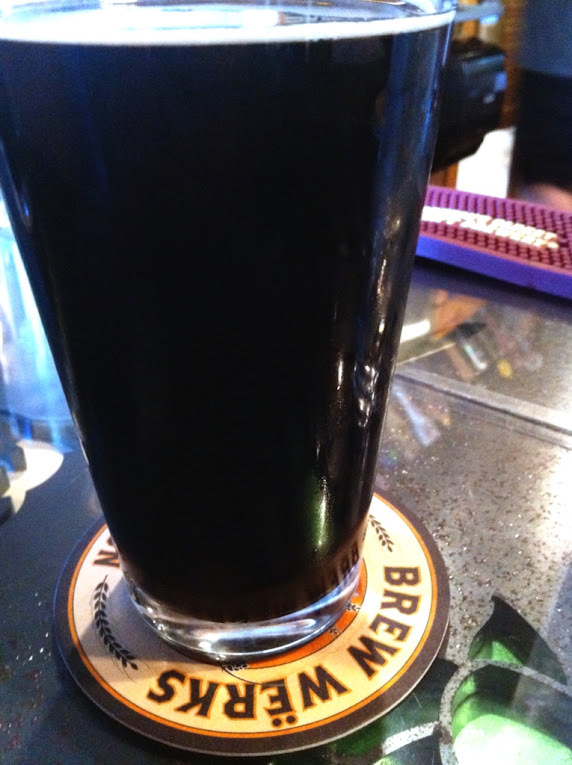 Big Butte Porter was a real nice beer, which is likely available at our large beer stores back home. Deschutes did not serve liquor. Their menu was "pub grub" and had a few nice entrees too. Next up was Bend Brewing Company. They had a nice location along the river. We ended up at barside pub tables and picked our beers - a porter and a hefeweizen. Both were decent. 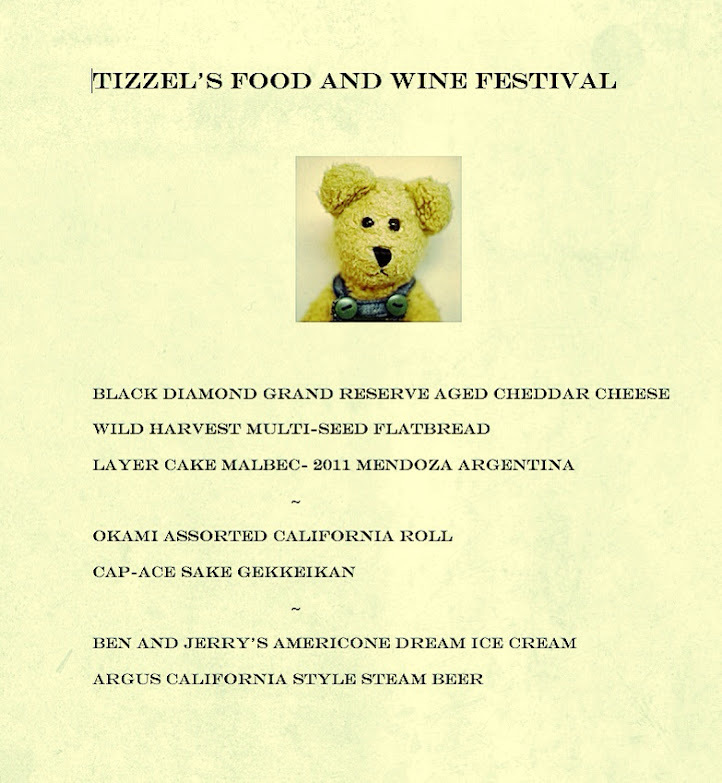 The menu's main focus was sandwiches and pizzas. Seemed more like a place you go have dinner at more than a place to sit around for a few rounds. Those were the last beers of the evening. Time to move onto something else to drink. In the following video we take a doughnut break and talk about how many beers we sampled before heading over to dinner. We found our dinner spot via twitter. Before our trip Holly tweeted Bend resident and professional cyclist Chris Horner (@hornerakg) and got a response back with a few suggestions. We decided to dine at Zydeco Kitchen & Cocktails. Dave researched the website beforehand and thought it seemed casual, but it was actually a bit more upscale. We didn't make ressies so we had a half-hour wait at the bar. Once we sat down we were treated to some great food. 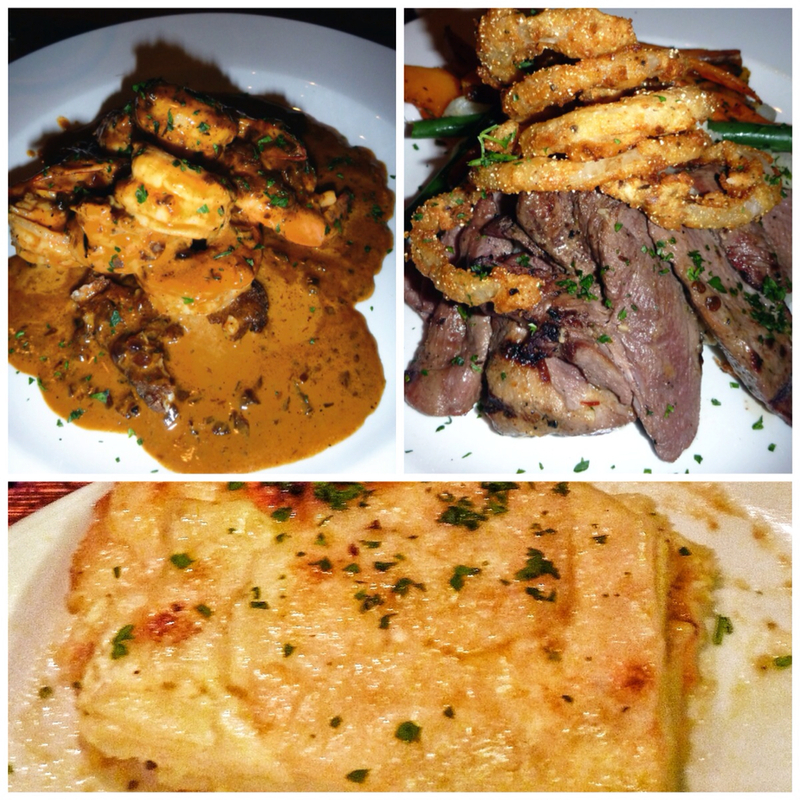 We had BBQ shrimp with a corn cake, shrimp étouffée, wild boar tenderloin, and truffle potato au gratin. We paired all this with a local pinot noir. Nice experience! The evening was capped off by a drink back at our hotel's cognac bar. This was housed in the old chapel building and was the home to the beer garden where people crowded around the fire pits. The next morning we shopped and browsed downtown, headed to REI for a last minute supply, and had lunch at the Old Mill Brew Werks. This was a small location buried in the middle of the Old Mill corporate park area. They were more of a taproom and small restaurant vs. a traditional brewpub. Because they were changing their brewing schedule at their main facility only one of their own beers was available - an IPA. We ended up with a few beers they had as guest taps from California. We had a nice lunch here and had fun talking to the bartender. We learned Oregon has high state income and property taxes which makes it possible to not have a need for sales tax. A win for the visitors! 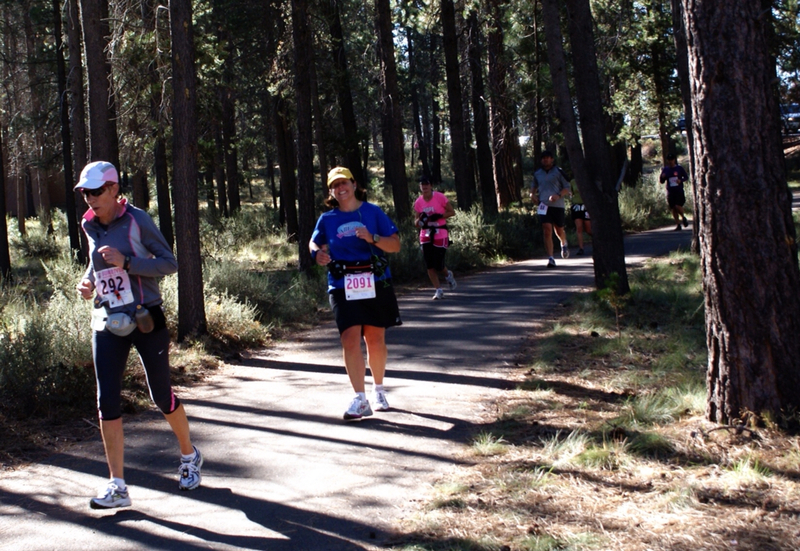 Next stop is Sunriver (about 20 minutes from Bend) for the marathon! 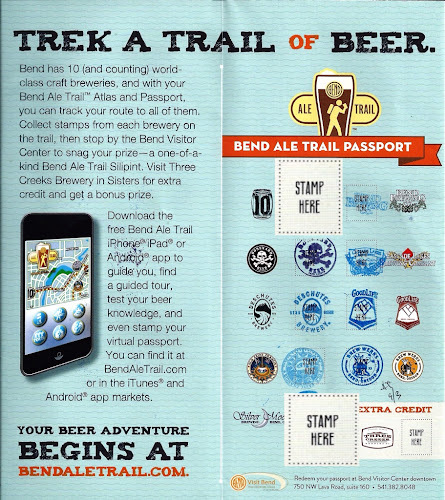 We didn't fill our passport, but we have two more scheduled trips into Bend. 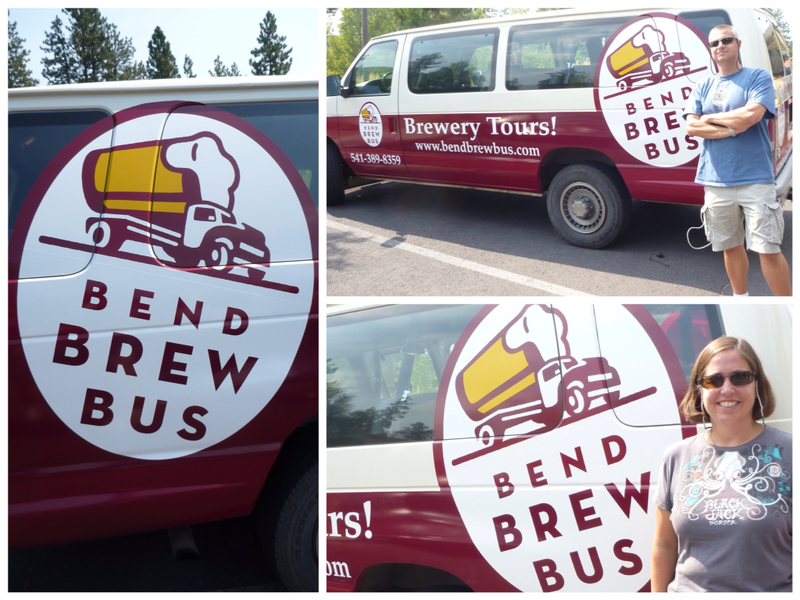 We left Portland around 8:30am, got to Bend around noon, had lunch, then boarded The Bend Brew Bus. 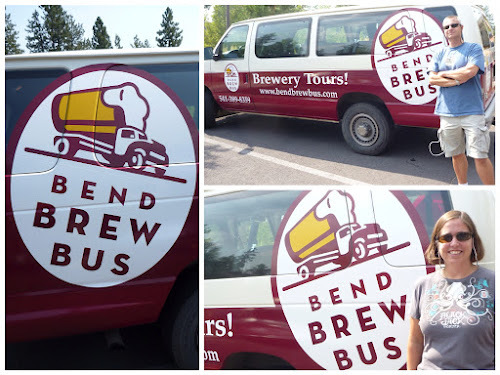 The Bend Brew Bus is a tour put together by Wanderlust Tours. 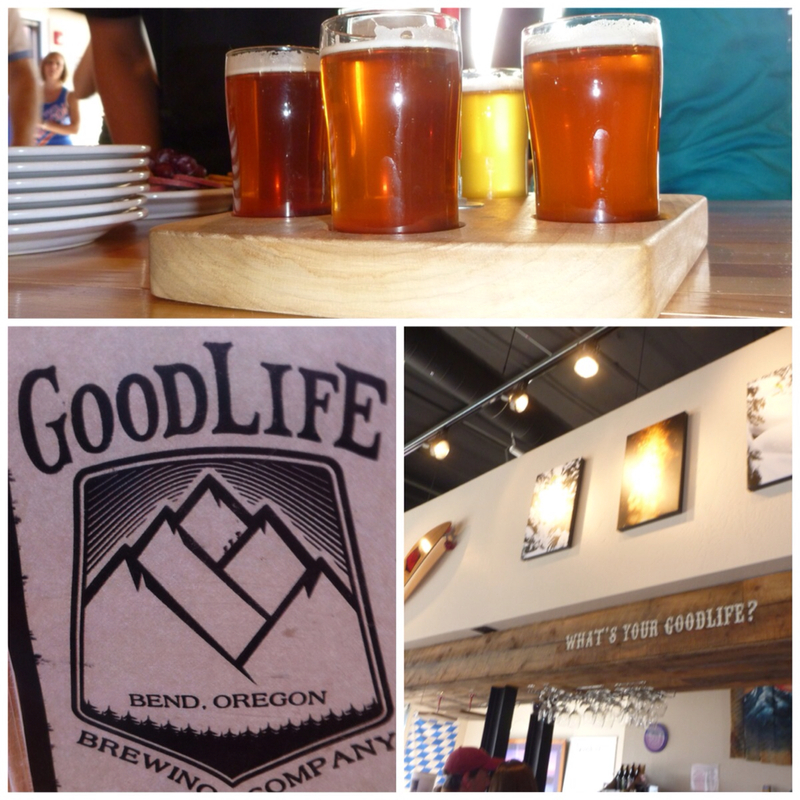 About a dozen tourists are treated to a four hour tour of four breweries in Bend, OR. Passengers are picked up from their homes or hotels so the driving is all taken care of by the tour guide. The cost is $45/pp and includes beer at four stops plus food at one of the stops. 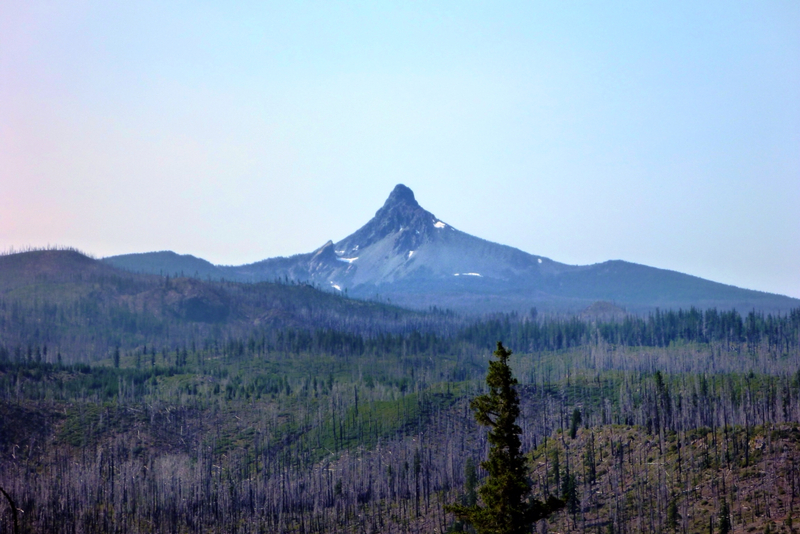 So why does a town like Bend with a population of 80,000+ offer this kind of tour? 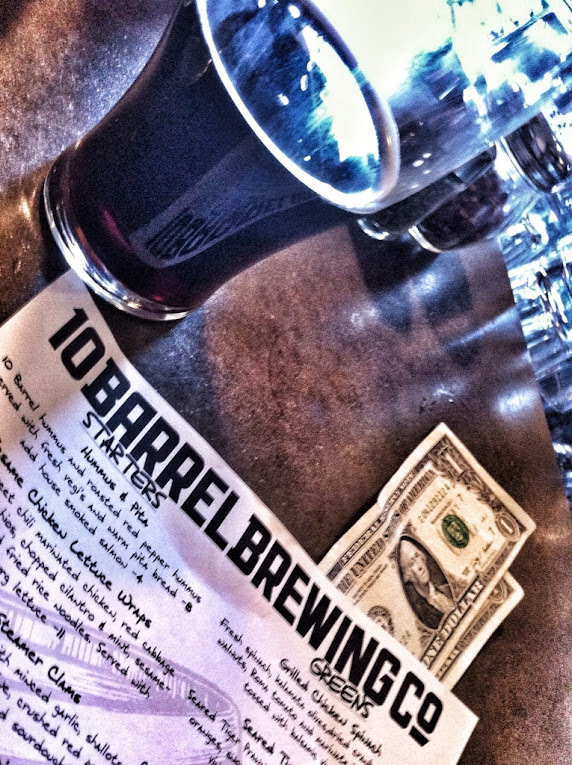 because there are 10 microbreweries in town and one the next town over. Bend's Tourist Board has cultivated the beer scene by developing the Bend Ale Trail and the Ale Trail Passport. If you get your passport stamped by nine of the breweries in town (the tenth brewery just opened and is not in the current passport) and bring it to the tourist office you get a gift. We figured the tour would be empty. It was a Friday before the holiday and folks were probably just getting on the road today..... Maybe just us and one other couple. Nope.....Full bus. Luckily we were the last pickup and at our first location in less than ten minutes. 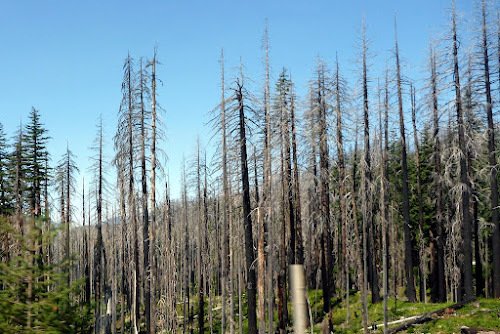 Cascade Lakes was our first stop. This is a newish-building on the outskirts of town. A good portion of the building was its dining area. Our guide, Rachel, explained that we had a private area upstairs and we'd be here an hour. This was also where we'd get the most beer at any stop. Take your time and mingle. Rachel worked with a waitress to brink up 5 pitchers of beer. We had 2 IPAs, red, porter, and nut brown. We were free to pour our samples and the pitchers would be replenished if needed. 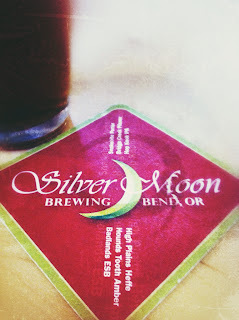 Our favorite beers of the tour were here, because they had dark beers that were more malty than hoppy. Most other locations had mainly Indian Pale Ales (yech). This is the prominent style in Oregon. We head back to the bus and it wouldn't start. While Rachel works it there's time for another bathroom break. Eventually we get back on the road and hit Good Life. 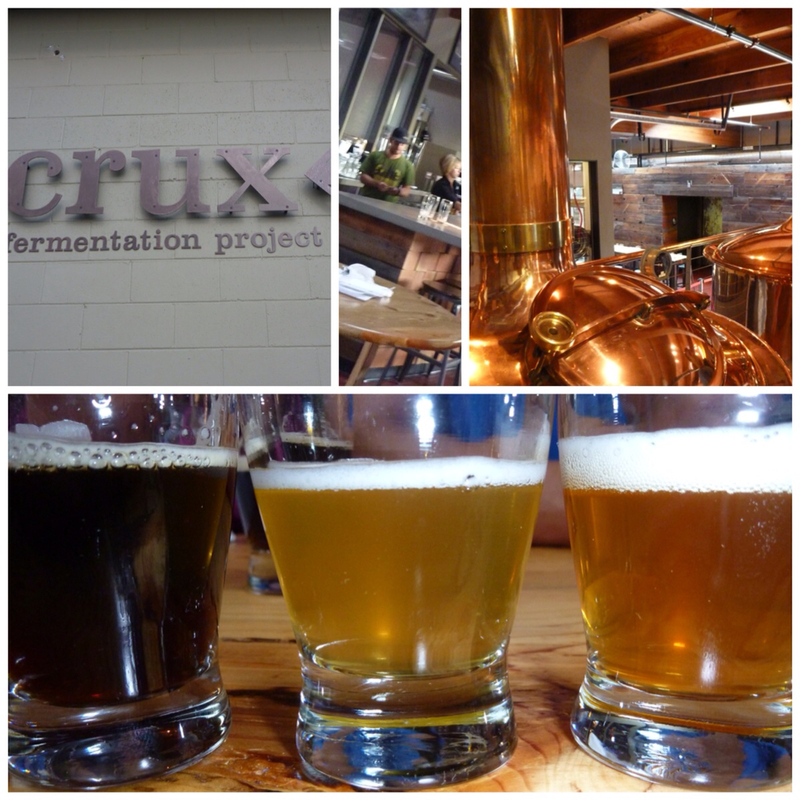 This is a newer brewery with a tap room that served food and had a beer garden. Here we tried 2 samples (both IPA) and food. Snacks consisted of huge plates of nachos and cheese and cracker platters. Nice. After snacks and samples we went into the brewing area and got a tour from brewer Steve. He gave a good overview of the technical aspects of brewing and how they source and contribute to the community's economy. A new van showed up and we took off for the next destination. 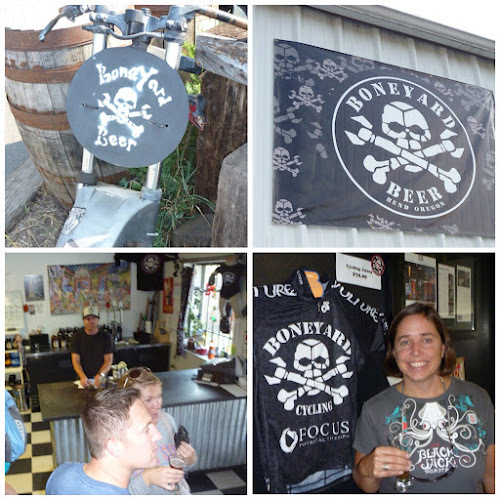 We drove closer to the older residential part of town and pulled up to an old auto repair shop that was now home to Boneyard Beer. The place had that biker/ heavy metal edge which is pretty uncommon in most breweries. That vibe really worked here - they named their company Boneyard because all their equipment came from other brewerys' used equipment. The tap room was a cramped area, but full of enegery has they tried to keep up with our large group and the regular customers. We were allowed 3 samples each out of the 5 on tap. We shared the strawberry beer (named Girl Beer), an IPA, a red, and something with "fuego" in the name. Hotter than sin...... Great group of folks here with true passion. On to our next stop. Bend's newest brewery - which was not on the passport. This game just got harder. Crux Fermentation Project was in the general area of The Old Mill District. It's an area filled with light industrial buildings, parks, and an outdoor mall. Their building sat on top of a hill with a clear view of the mountains from their beer garden. Inside was a nice contemporary mix of stone and wood. The brewing area had large copper brew kettles as well as an open fermentation room for Belgian style beers. We got a quick tour of the kettles and brewing area after we had three samples: we remember a porter and an IPA and forget the third style (kolsch maybe). Lots of other guest taps were available. Back on the bus and in our room by 5:45. The tour was a lot of fun and has a repeatability factor given they can go to a mix of four out-of ten breweries on a given day. All the brewers we met with were friendly and totally into what they produced. 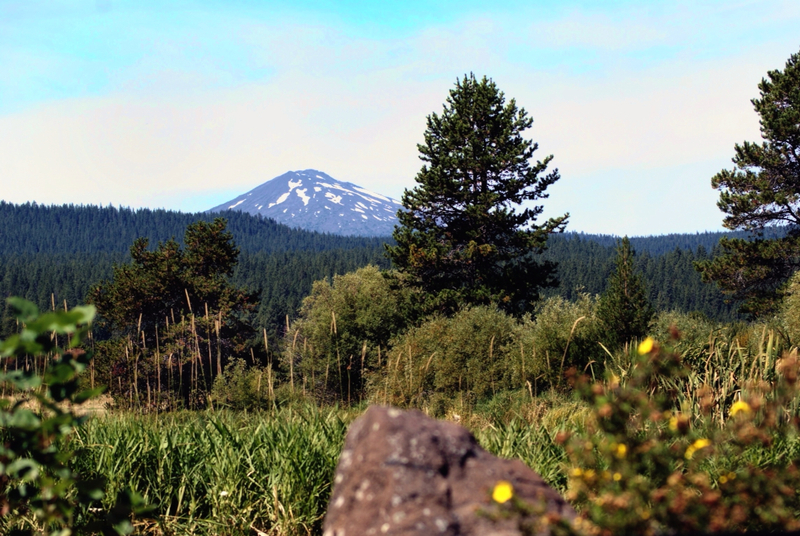 Bend, Oregon was our destination today. The iPhone map software said it would take 3.5 hours to get there. With stops, that was pretty accurate. There are two logical routes to take from Portland to Bend. 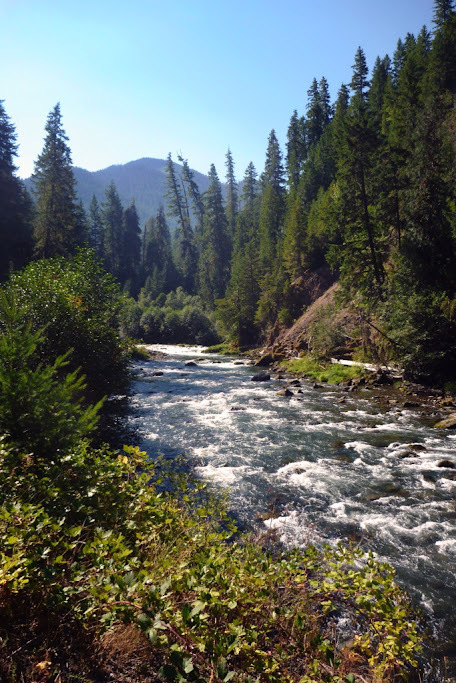 One is by going south to Salem, then head southeast through the Willamette and Deschutes National Forests. The other route take you through Mt. Hood National Forest and through portions of the high desert. 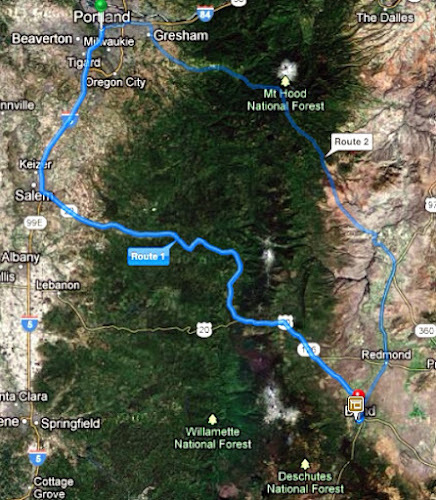 Since both routes we're relatively similar, we took the Salem-two forest route there and would take the Mt. Hood route back. This was a very pretty, but somewhat desolate route. Once we left Salem we spent hours in a tunnel of trees. There were a few towns here-and-there but most seemed to offer some minor services for campers and tourists. Many businesses along the way were closed-up. Our favorite sign read "Next gas 52 miles" with no last chance gas station near it. Thanks for the help. 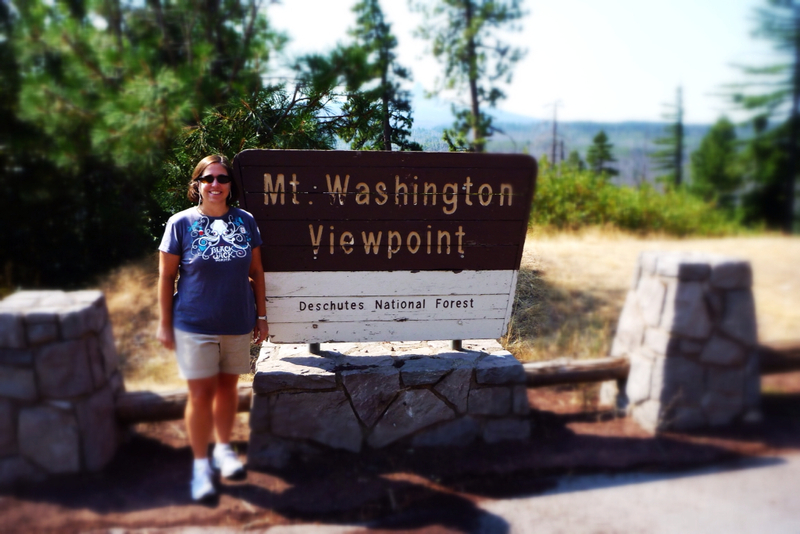 There were a couple of scenic stops on the way including one to view Mt. Washington. Here's a five minute video of our ride down, and a reveal of our Voodoo Doughnuts. We miss them already. 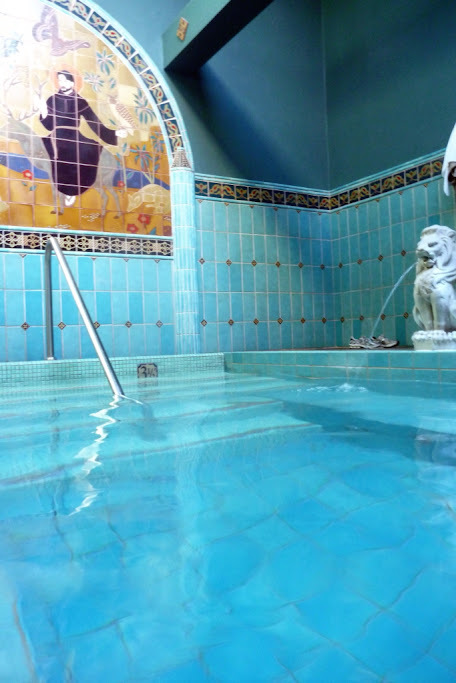 In our last post we mentioned that we stayed in the Old Saint Francis School Hotel. At first, Dave wasn't sure about this place - seemed a bit "earthy". But Tripadvisor gave it high marks, and it had a brewery attached to it, so why not? This place was great. 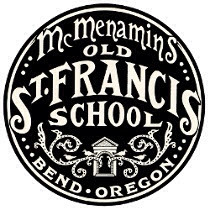 The chain, McMenamin's has a great reputation around the Northwest. The company buys older buildings of some significance, spruces them up, and turns them into unique lodging opportunities. 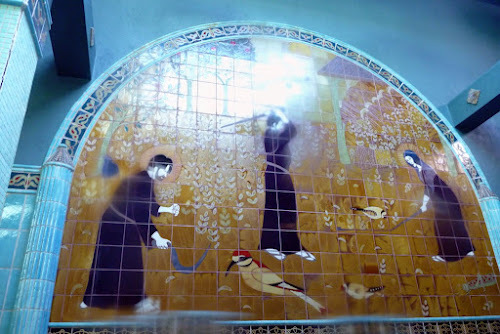 At our hotel we had a microbrewery, two other bars, a lively outdoor beer garden, movie theater with couches and bar service, and a Turkish bath. Yes....a Turkish bath. Rooms had great soap products, robes, and coffee makers. Fresh ground coffee was delivered to your door step in the morning. Every corner of the resort has hand-painted details. Our hotel hallway, which was an old school, was lined with class pictures and had a working old-school water fountain. If there's an opportunity to stay at one of their properties again we definitely will.